If you wish to set up an additional website with FASO, we offer a 20% discount on the account (which of course includes the free trial period!). The 2 sites must be administered by the same person, and not require any special handling from our side. The discount only applies to our Gold and Platinum plans. The discount starts on the 2nd monthly billing (ie the 1st month gets billed at the regular rate). Once the account has been set up and the plan chosen, let us know so that we can add the 20% 'second site' discount to the new account. If you wish to pay yearly, please contact Tech Support so that we can make all the necessary arrangements. How you set up the 2nd site is based on one important criteria: the email address you use as the Admin Email address on the account. You have 2 options. 1. Option 1: Using the SAME Admin Email address on both accounts. Setting up the second account this way will allow you to toggle between the Control Panels of the 2 accounts. 2. 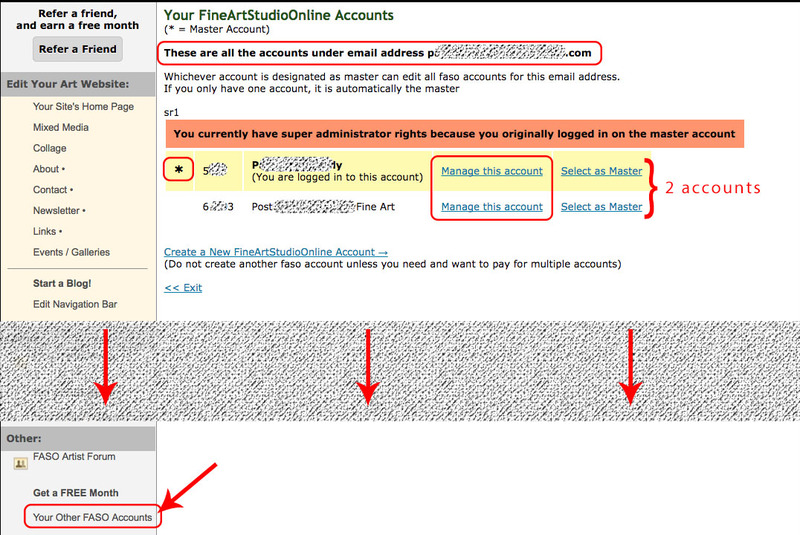 Option 2: Using a DIFFERENT Admin Email address on the 2nd account. When setting up the account, you can use your business name like Mississippi River Gallery. This listing will now show in the Artist Directory under M for Mississippi River Gallery (instead of R for River Gallery). You have to use your USERNAME, not your Admin email address, to login to any additional account. Attempting to use your email address will fail. Using your Admin email address for logging in ONLY works for your Master account. We recommend that you log out of the Master account prior to logging into any additional account. NOTE 1: the email address needs to be confirmed on any additional account in order for this to function. It will tell you right on the screen if you need to Confirm. See this FAQ: How and why do I confirm my email address? NOTE 2: It helps to get in the habit of double-checking the name of the account, upper right corner, if you edit multiple accounts. This ensures that you are on the correct account.